E21* is an immersive two-day conference that will bring together librarians, educators, workforce development professionals, makers, and artists. Over the course of the conference, participants will explore emerging technology in support of a culture of creativity and innovation for the 21st century. Attendees will acquire a range of tools they can use in libraries, classrooms, and other public or private learning spaces, or for their personal creative or professional endeavors. Centered on developing new skills and techniques, E21 will introduce participants to programming languages (Scratch, Processing, Ardublock…) and electronics platforms (Arduino, LilyPad, Makey Makey…), combining them with traditional craft techniques (sewing, origami, sculpture, book-making). Putting tenets of the maker movement into practice – collaboration, experimentation, invention, and play – everyone will take part in hands-on project creation. Participants will also attend talks and discussion sessions on topics ranging from making a creative laboratory space in a small rural school or library, girls/women and emerging technology, project development, and market introduction of inventions. 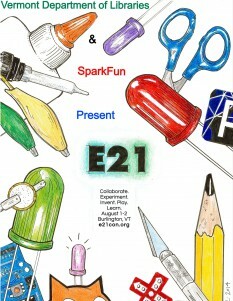 E21 will begin the evening of Thursday, July 31st and run through the afternoon of Saturday, August 2nd. Registration fee includes lodging, breakfast, and lunch for two days. We are pleased to be hosting E21 in Vermont.